Call of Duty gets a lot of stick - some of it deserved - for being "stupid", but here's a neat little touch I found in Advanced Warfare's singleplayer campaign that's worth a closer look. It's early on, during the rescue mission in Lagos, and I originally took the snap because I was grabbing screenshots anticipating some more entries in this feature. This one was a nice surprise, though, since it's real. That's a slogan that actually adorns homes in Nigeria's capital city. "419" is the section of Nigeria's criminal code that covers financial crimes, and while famous for its use to dupe foreigners on the internet to part with their cash, 419 crimes also take place in the real world. 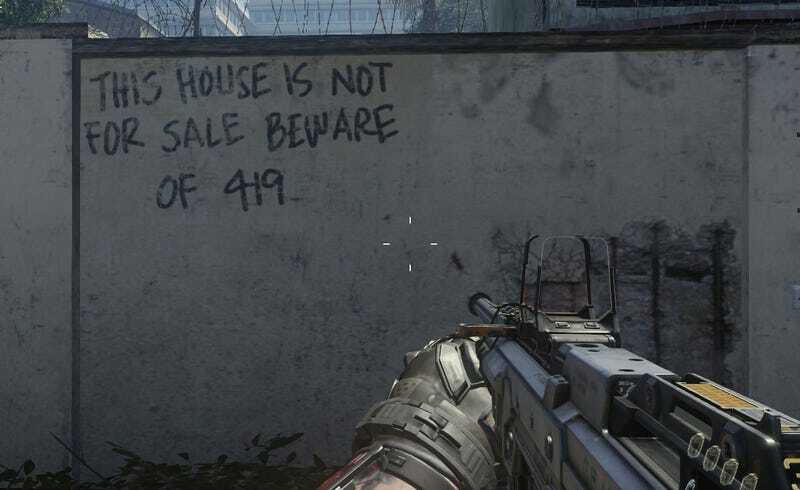 I am certain I am not the only person who has noticed the ever-present, elaborate defacing of buildings with bold lettering announcing, "THIS HOUSE IS NOT FOR SALE", and the almost always present caveat, "Beware of 419". In a city like Lagos, it is now like a design pattern on houses. Hardly any street, even in the highbrow areas, is free from it. When they are not engraved on the walls of the building, the words are conspicuously placed on signboards around it. For a visitor, I imagine that the first impression will be that crime is now so rampant that we need to unashamedly make public announcements to alert people about it. However, to one who is already well aware of our global popularity for scam mails and advance fee fraud, popularly known as 419, and who must have been inundated with travel warnings about Nigeria, it must be an interesting sight to note that not only do we scam unsuspecting foreigners, we daily make mincemeat of our fellow countrymen who make the mistake of 'dulling'. And as an adaptation for prevention, we deface our houses and scream warnings to the high heavens. Real estate in Lagos can be...chaotic, and these warnings are to remind folks that even if a "real estate agent" turns up carrying property papers, there's no telling if they're actually genuine or not. Seems like a pretty minor thing to get hung up on, but I guess I like it because, while developers taking trips to actual locations for scouting is nothing new, it's rare you see them (in this case artist Tavershima Shande) work anything other than architecture into their games. Slotting some cultural commentary - however out of place it might be by 2055, the year the game takes place - gives AW's Lagos a little more sense of being than if they'd just copied the streets and facades.